Oh, people. Remember my list of "Things That Are Stressing Me Out"? Well, last night at dinner the girls said to me, "Guess we can cross off 'check if sheep are pregnant', and 'find out what I need for lambs' birth', and 'set up lambing pens' "! 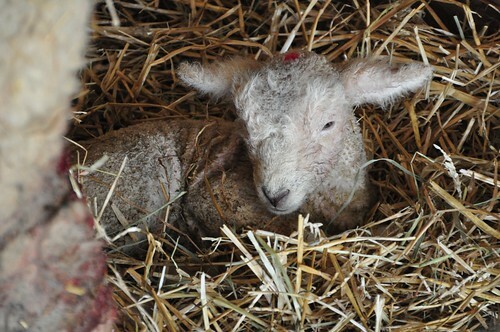 Totally unexpectedly, and probably for the best, I was greeted at my bedside very early yesterday morning by my breathless husband...."You've got lambs. Two of them!" 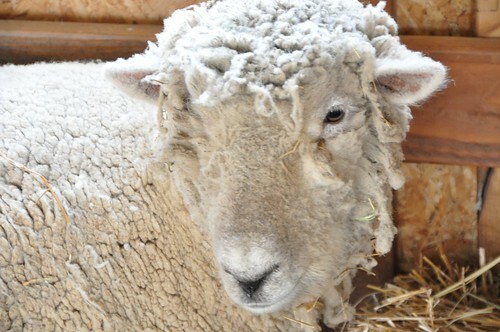 He was on his way to work and just as he was pulling out, remembered something he forgot, and as he stepped out of the car to get it, he knew that the sounds he was hearing from the sheep shed were most definitely NOT Penny or May. 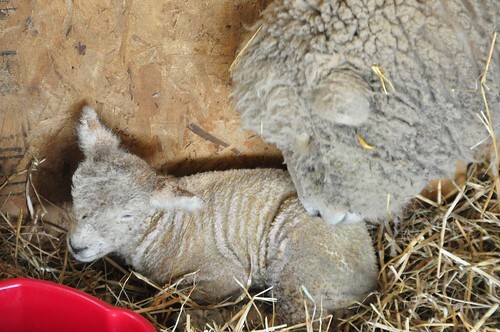 I pulled on my boots and went out to the barn in the dark of yesterday morning to discover two sweet and still-wet baby lambs being every so carefully cared for by Penny. Those first few hours were nerve-wracking, I tell you. Watching them struggle to nurse and latch on. Me, lying under a very patient Penny and making sure her milk was starting, trying to direct teats into tiny mouths...(yes, I may have over-managed this a bit. ), but little by little, under my nervous eyes, all is well. 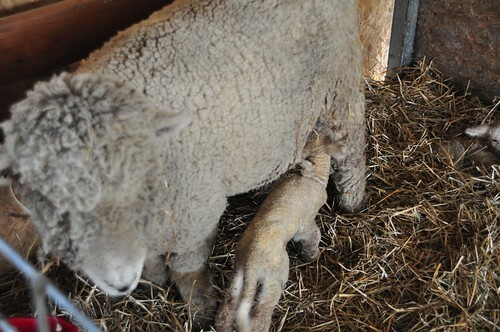 Though one is smaller, they both seem to be nursing. Dan and I took turns checking on them throughout the night and we made it with no problems. I couldn't have asked for a better mother. Penny is patient and calm and just the right amount of protective--that stamp of her foot at the cats wandering into her pen, or when too many people are visiting her, lets us know she needs her space. And the babies, keeping with the tradition of naming them with the same letter as their mother, are being called Pete and Paige. A boy and a girl. Next comes May. Maybe Penny's little ones will trigger something in her. She is definitely keeping a watchful eye on everything. Spring is most definitely just around the corner. I was most-honored to be asked to write something up for new-to-me site 3ThingsForMom. Joined by other lovely contributors like Heather of Rookie Moms and Pilar Guzman of MS Living (hello!?!) I shared my 3 things this week--a truth, a tip, and a find. I think some of you may recognize my truth. It was a lesson that needed some serious re-visiting in my life these days. Be sure to check out Lauren's lovely site. It is a well-crafted collection of mama-wisdom. My favorite way to procrastinate is to pour my energy into all the wrong things. Case and point, I'm about to do a major move and redesign of this blog. I'll be moving to a new host which requires pushing the figuartive "big red button" and moving my eight years of writing over to the new space. So if things look wonky or strange for a few days, bear with me. I hope to have things ironed out soon. We have a moving date! The Woodlawn house will be HOME beginning the weekend of March 9. Ack, just over a week away. Perhaps it's time to pick out a faucet for the kitchen sink? We're living in the land of chaos, but every time I step foot in that sweet old house, my heart thumps in my chest with anticipation and joy of calling it home. I can't wait to share more of the process and projects with all of you! 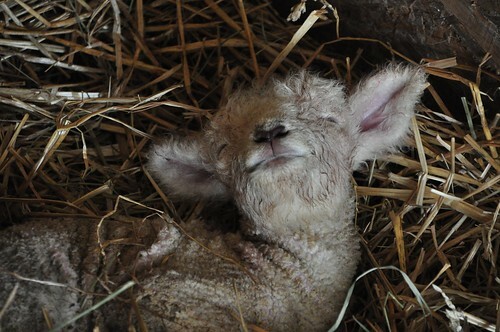 And in the midst of all that, keep the lamb pictures coming! ;) They're too cute. molly... how fabulous.... new beginnings all around! Those precious lambs! I love them and sweet Penny. What a gift their little lives are! Oh my goodness, they are so sweet! A perfect Spring! Sweet new babies, new house, kids itching to get outside...love love love! Sooo cute! 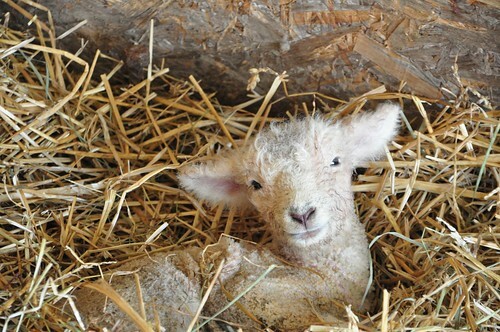 Welcome little lambs! yay! how exciting! and they are so cute, too. I love waking up to a new post from you. 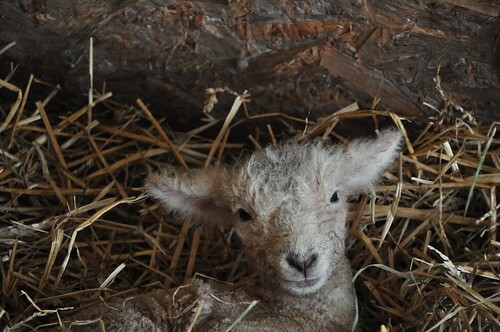 Those lambs are the sweetest and I am so looking forward to seeing the pictures of the new house. Woodlawn is so lucky to have you! I'm almost as excited as you are, Molly!!!!! !